The #GABRAN2015 was held from the 21st to 23rd August 2015. (Great Annual Bicycle Ride Across Natal). The three day cycle event, Great Annual Bicycle Ride Across Natal began on a pleasant and not too fresh morning at the ATKV Drakensville resort and winds its way up hills and down dales to Hillcrest. Cyclists from far and wide joined the event – from Secunda, to Ladysmith – Durban and beyond. 300 odd kilometres of cycling, over 3 days, up and down hills and dales, across our beautiful KZN province, tents, bags, camping chairs, (everything but the kitchen sink!) were loaded into a 4 ton truck, sponsored by the Super Rent Group, which transported all our belongings from start to finish; and all the stops inbetween! This is most certainly KZN’s most beautiful cycling event – This is not a timed event but rather individuals determining their own pace on each day – no podiums, no pressure. Our Goodie Bags are a major talking point – thanks in large part to so many individuals and companies who have jumped on board to support our riders – and the delight on their faces, and the silence when lifting the jam packed bag, bear strong testimony to the fact that they were awe-struck by the kindness of so many. It is possibly the BEST goodie bag ever! Pitching tents for our overnight stops, new friendships being formed, many photographs being taken, and memories that will last all those that took part – a lifetime. Various compulsory grazing stops are on route, the first being the Winterton Country club that provided enough sandwiches to feed the hungry cyclist and hot tea, coffee and for the brave some cool juice to quench the thirsts. The cheese and chutney sandwiches were most certainly the hit of the platters! After feeling well fed, and watered, the hills into Estcourt beckoned…. Groans were heard as the momentum from zooming down the hill “evaporated” as the next uphill came into play – onwards we soldiered, as the Estcourt Bowling club was howling many cyclists names …a merry gathering of cyclists, sharing war stories, puncture repairs, some more puncture repairs and just a general feeling of “Love Living Life” was portrayed. It was soon apparent, that all the climbing into Estcourt left the cyclists feeling hungry – so, helmets on, speedometers set, we were off – to our first campsite – Wagensdrift dam. The once open and quiet campsite was suddenly abuzz with cyclists, pitching tents, laughing at others attempting to pitch tents, and yes, assisting along the way. A hearty cooked lunch was served. The afternoon was spent chatting to fellow neighbours, meeting new people and just a general well-being of being out in nature. It was not long, then dinner commenced; queues were formed and the famous “Clip or Klap” was called – Cyclists had wristbands that indicated the various meals – and as they queued for their meal, so they were handed a plate, and the wrist band got clipped. The GABRAN is definitely for the hungry – and chance of any “weight-loss” is not going to happen… thanks to 3 cooked meals a day; not counting the many grazing and drinking stops on route for which the KZN Midlands is famous! Saturday morning rumbles began at 5am – as tents needed to come down, bikes needed to be checked, bags packed, and breakfast consumed. Cyclists started leaving on the “grey concrete road” the first climb of the morning; this was followed by Bacon Hill (past the Estcourt Bacon Factory) and then, the gorilla of all hills – Griffon ( Griffin? }… despite the long, long climb, smiles, waves, and at times cringing was had. Back-up drivers tempted the cyclists with bottles of Jagermeister… and as the cyclists approached them, the vehicle was off again into the sunrise…. The feeling of euphoria on reaching the summit is one all need to experience. From there, it is all downhill into Mooi River, with yet another compulsory stop, or “second breakfast” at the local Wimpy. An absolute delight to see the Wimpy entrance becoming a bicycle park! From here, it was up the FINAL hill towards Midmar Dam – our home for the second night. But before the cyclists could call it a day at Midmar; of course, the Bierfassl beckoned – and a FORCED stop was made. After a few ales, coffees and hot chocolates, the descent into Midmar began. We were now pros at pitching tents, showering, finding kit for the evening in untidy bags and securing bikes for the night. Once again, we had some live entertainment – with Karaoke – GABRAN HAS TALENT!! There were those that could sing, and there were those, that well…..provided much needed ab-exercises from laughter! The third day dawned too soon, as cyclist took the fast decent into Martizburg with caution, and then onto familiar territory of the Amashova Cycle Route. Hillcrest was the finish line – and lamb on the spit was wafting through the air. The aim of the event was to raise funds for the COWS who are the fundraising arm of CHOC (Childhood Heamotology Oncoloy Clinics). GABRAN helped us raise much needed funds for our little superheroes fighting various forms of Cancer! The entry fee for the Gabran Cycle Event is used purely for covering costs of the meals the event is catered for by a professional catering company from Durban, the campsite costs, hiring of marques for the make shift kitchen and dance area, and of course a paramedic – without any of these, the event simply cannot take place!! No admin fees are deducted from the monies – we are all volunteers, doing what we love, for those, that can only hope and dream of having an active lifestyle, beyond the 4 walls of a hospital room, drips, needles and other medical devices. We were blown away by very generous sponsorships of various prizes which we could raffle – from 2 nights away at a 5 star hotel, Beverly Hills in Durban, to 2 nights at a Ndaka Safari lodge, various passes to Holla Trails and Giba Gorge, All out Adventure packages – to name but a few. The cyclists all did their share, and sold as many tickets as they could. They also dug deep into their pockets to buy fudge/coconut ice and date crunchies – which were also sponsored at a discounted rate enabling us to pocket any profits. We sold out of all our “sweet treats” and agreed that next year, we need to double up! All the GABRAN participants from cyclists to back-up drivers to support crews truly embraced our “Love Living Life” slogan and mixed it with an overdose of enthusiasm. 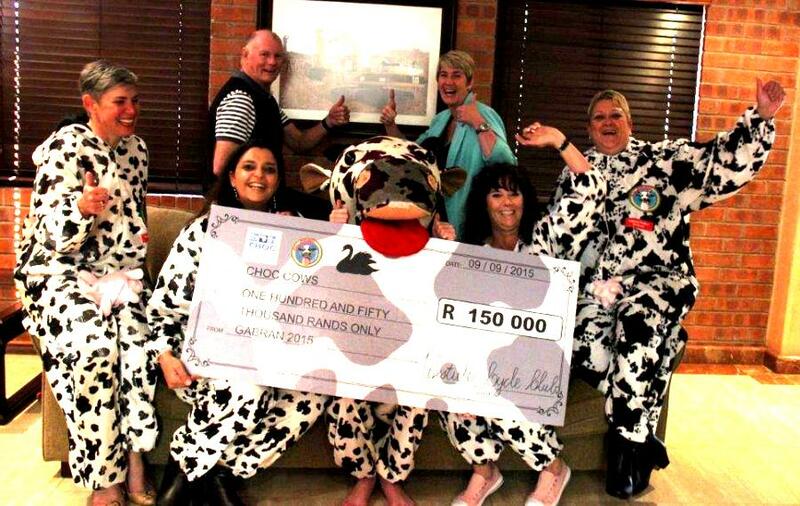 We were silenced when we counted the moo-lah, did various mathematical calculations on our hooves and came to a grand figure of R65 000! – a fantastic improvement of R25 000 more than last years figure of R 40 000. Once again we could not believe our “hooves”… this was, however, rather short lived. One of the corporate participants, Liviero, who support the event with a team of cyclists confirmed they had secured and would be donating a further whopping donation of R80 000 to the cause. 3 days of fun, sweat and laughter, and a R150 000 later, concluded it was indeed a most successful event all round. Once again we thank all the riders and sponsors from the bottom of our “hooves and udders” for your support and contribution to making #GABRAN2015 what it was!